Tag Archives: international financial institutions (IFIs). How Can Small States Like Iceland Work Effectively With International Financial Institutions? Note: The term “emerging markets” is used in this article to refer to countries with low or middle income according to the World Bank (see, e.g., International Finance Corporation, 2006). This article thus uses a broad definition of emerging markets. Several other definitions of the term can be found in popular textbooks on international business (see, e.g.,: Czinkota, Ronkainen and Moffet, 2005; Rugman and Collinson, 2006; Wild, Wild and Han, 2008, and Daniels, Radebaugh and Sullivan, 2007). Multilateralism is the international governance of the many. It opens up the possibility for small states along with larger states to participate in international decision making. According to Thorhallsson, the small states literature generally claims that it is beneficial for small states to concentrate on multilateral relations within international organizations (Thorhallsson 2005). Keohane argues that a major function of international organizations – perceived by many small and middle powers – is to allow these states acting collectively to help shape developing international attitudes, dogmas, and codes of proper behaviour (Keohane 1969). When discussing multilateralism Kahler states that “Smaller, weaker states were believed to be disadvantaged by bilateralism…” and “In their formal institutional design at least, most postwar multilateral institutions incorporated a larger role in decision making for states that were not great powers and could not aspire to be.” (Kahler 1992, p 681). When discussing small states as aid donors Hoadley predicts high levels of participation of small states in multilateral agencies (Hoadley 1980). This article will focus on the case of Iceland and the discussion will be limited to international financial institutions that are engaged in international development cooperation with emerging market economies and developing countries. Does the case of Iceland demonstrate high levels of participation within IFIs? Has Iceland been pro-active or reactive within IFIs? How would the participation of Iceland be classified according to Keohane system role of states: i.e. systems determining, systems influencing, system affecting, system-ineffectual (Keohane 1969). Could Iceland as a small state be more influential within IFIs? How can small states best contribute to international development cooperation given the recent developments in this area of international development cooperation? One could argue that it could be feasible for a small country like Iceland to work more in partnership with IFIs in emerging markets, for example: (i) when assisting the governments in those countries on a project basis, (ii) when engaging in economic policy reform dialogue with their governments, and (iii) when its private sector engages in business and investment operations in those countries. This is important both for Iceland’s multilateral development cooperation when Iceland as a small country works with, and through, IFI´s and its bilateral development cooperation if Iceland partners with IFIs and other donors e.g. by cofinancing budget support operations. The article will thus both focus on cooperation and coordination with IFIs on the multilateral and bilateral fronts. It will also discuss private sector cooperation with IFIs since those institutions increasingly emphasize the importance of international business and investment to boost growth in emerging market economies. In addition to official development assistance to governments, cooperation with IFIs may become increasingly important for Icelandic firms if they expand their business activities and investments in emerging markets that sometimes have risky investment environments, including in the energy sector. Also, the current global financial crisis and the banking crisis in Iceland could make it feasible for Icelandic firms to work in partnership with IFIs and more actively seek access to some of their financial products, including equity participation, loans, guarantees, advisory services, etc. In the case of Iceland the Ministry for Foreign Affairs (MFA) is formally responsible for it’s bilateral and multilateral development cooperation in emerging market economies (including in developing countries). Part of this responsibility is the conduct of Iceland’s relationship with international financial institutions (IFIs). IFIs operate in emerging market economies and support both government projects (e.g. infrastructure projects) and economic policy reforms, where they often provide loans upon the successful implementation of agreed policy actions. IFIs also increasingly recognize the importance of the private sector as a source of funding economic reconstruction in emerging markets, e.g. via foreign direct investment and business activities that contribute to economic growth, and have separate departments and/or agencies that specialize in private sector cooperation and services. The MFA handles the relationship with the World Bank Group while the Ministry for Commerce deals with EBRD. Both institutions work with governments of emerging market economies and increasingly emphasize promotion of private sector activities. Iceland is not a member of the regional development banks: The Asian Development Bank (AsDB), The African Development Bank (AfDB) and the Inter-American Development Bank (IDB). All the other Nordic countries, that Iceland likes to compare itself with, are members of those regional institutions that all play an important role in economic reconstruction in their regions. On the bilateral side Iceland has a development agency, the Icelandic International Development Agency (ICEIDA), which is formally under the MFA, but has traditionally functioned rather independently. Until recently ICEIDA had its own law, originating from 1981, and an independent board of directors with seven members, of which six members were elected by the parliament (Alþingi) and one appointed by the Minister for Foreign Affairs, who also served as a chair (Alþingi 1981). Given the fact that the Minister for Foreign Affairs appointed only one member of the board limited his/her power over ICEIDA’s operations and in practice ICEIDA has conducted Iceland’s bilateral development cooperation with limited involvement and coordination from the MFA. In September 2008 the Icelandic parliament passed a new law on Icelandic International Development Cooperation (Alþingi 2008). Unlike the previous law from 1981, this new legislation covers both bilateral and multilateral development cooperation. One consequence of this new law is a new institutional structure both within, and outside, the Ministry for Foreign Affairs (Alþingi 2008). It remains to be seen how the new legislation and structure will affect the conduct of Iceland’s development cooperation in the coming years and decades, and its relations with international financial institutions. 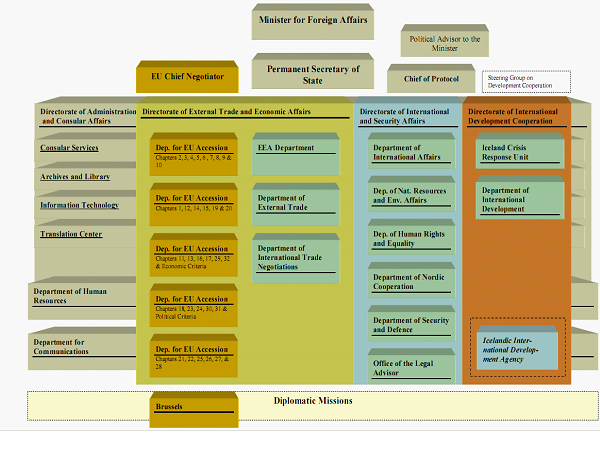 Recently the Ministry for Foreign Affairs also established a separate Directorate of International Development Cooperation see figure 1 (Ministry for Foreign Affairs 2010) which is an attempt to strengthen MFA’s coordination capacity in this area. According to the new law the parliament elects seven members of a Development Cooperation Committee whose main purpose is to secure the role of the parliament in policy and decision making with regards to international development cooperation in the long-term (ICEIDA 2008b). The members of the committee also take a seat in the Council on International Development Cooperation with 17 members on its board. The Minister for Foreign Affairs appoints representatives to the Council on International Development Cooperation, the chairman without nomination, but in addition to the members of the parliamentary Development Cooperation Committee, the board consists of five members from Icelandic aid agencies, the chair appointed by the Minister, two members from the academia and two from the labor market side (ICEIDA 2008b). Members of the Council on International Development have been appointed and its first meeting took place in March 2009 (ICEIDA 2009a and 2009b). There is also a Steering Group on Development Cooperation, whose role for some reason is not specified in the new law, but which seems to be meant to be an internal management body for the Minister for Foreign Affairs, see figure 1. The thinking seems to be to have this committee manage Iceland’s Development cooperation in the short-term while the Council on International Development Cooperation seems to be like an advisory body for long-term policy making, and according to the new law is to meet at least twice a year. IFIs are important for Iceland both as a formal mechanism to channel its multilateral contributions to developing countries and emerging market economies and as a venue to participate in the international policy dialogue with these countries. IFIs can also be a key partner in the field where Iceland’s bilateral development agency, ICEIDA, is operational. MFA’s capacity to conduct Iceland’s relationship with IFIs has, however, always been weak and its structure is fragmented. On the multilateral front the Ministry for Foreign Affairs does not handle the relationship with the few multilateral organizations that Iceland is a member of. MFA has also not sought, or even considered, membership in some key IFIs like the regional development banks. Why has Iceland shown so little interest in IFIs? The low priority attached to cooperation with IFIs by the Icelandic government is unusual given the fact that Iceland is a Nordic country. The Nordic countries, who all are usually considered to be small states, have for a long time been among the most active countries in the world in development cooperation and in engaging with IFIs. Iceland is a founding member of the World Bank and the European Bank for Reconstruction and Development (EBRD). Iceland has also been involved in international development cooperation bilaterally since 1971 (Alþingi 1971) and its bilateral development agency, ICEIDA, was established by law in 1981 (Alþingi 1981). More recently Iceland has also become active in private sector activities and shown interest in cooperation with the private sector arms of the IFIs. This is especially true for the energy sector. Several Icelandic companies have been internationalizing their operations and investing abroad, including in emerging market economies where IFIs are active. In spite of this, Iceland has kept a very low profile within the IFIs and has not sought membership in the regional development banks. As small states the Nordic countries, especially Denmark, Norway and Sweden have taken a very different approach vis-à-vis international financial institutions. They have always regarded themselves as being fully capable of participating and sometimes leading the policy dialogue within the international community. They have also considered it important as part of their foreign policy to take part in contributing to economic development and world order. Their financial contributions to international development cooperation are among the highest in the world and they are among a few countries to meet the UN target of contributing 0.7 percent of gross national income (GNI) to international development cooperation. In the case of the World Bank´s International Development Association (IDA), whose main role is to assist the poorest countries in the world, the Nordic countries have often contributed more than their economic size would require them to do. According to Thorhallsson the limited interest in the work of the World Bank is a clear reflection of Iceland´s international approach. Direct economic benefits for Iceland seem to have for a long time been a prerequisite for its international co-operation (Thorhallsson 2005). The special bilateral relationship with the United States, that Iceland benefited from both economically and on security is also important when explaining the conduct of Iceland´s foreign policy. This relationship may help explain why Iceland has for so long favored bilateralism. This emphasis on bilateralism in Iceland contradicts the small-state literature concerning the importance small states are assumed to attach to working within multilateral organizations as discussed earlier in this article. However, the recent increase in Iceland´s contributions to development cooperation before the current economic crisis, the new legislation on Iceland´s International Development Cooperation, as well as its bid for a seat at the UN Security Council shows that the government was becoming more committed to participating in, and contributing to, international cooperation. As Thorhallsson puts it “…an interesting shift of prioritization has occurred since the mid-1990s which can be attributed mainly to changed perceptions and preferences of a large part of the political elite and external pressure reflecting greater demands made of a small affluent state in the international system.” (Thorhallsson 2006, p. 202). A seat in the UN Security Council was unrealistic given the limited resources that Iceland has and the global financial crisis, that hit the Icelandic economy hard, has already resulted in cuts in its development budget. However, according to Thorhallsson “There has been a shift of priorities from a narrow focus on direct benefits from overseas relations to more broadly-defined interests in terms of importance of contributing to the work of the international community.” (Thorhallsson 2006, p. 218-219). Iceland is in a transition phase and had prior to the current crisis shown an interest to become more active within international organizations including the UN and the World Bank. Given their size, and multilateral nature, the IFIs have an important coordination role to play in the world and provide a venue for and leadership in the dialogue on development policy and development effectiveness. This is especially the case with the World Bank Group which is by far the largest of the IFIs and whose membership includes most countries in the world. Many countries that contribute to development cooperation choose to take part in a policy dialogue with their partner countries and are concerned about how economic policy is being formulated and implemented in emerging markets. In 1980 the World Bank introduced its first structural adjustment loan which marked a shift from project aid to program based approach, where policy conditionality played an important role. Since then there has been a substantial shift in the international institutional environment for development cooperation and a number of important donor meetings have taken place, and declarations issued on aid effectiveness. Among those are: the Copenhagen Summit in 1995, the Millennium Development Goals from 2000, the Monterrey Consensus 2002, the Rome and Paris Declarations on Aid Efficiency from 2003 and 2005, and the Roundtables on Managing for Development Results. World Bank´s Comprehensive Development framework launched in 1999 is a notable change in the World Bank’s development approach and the OECD DAC guidelines are also important. As a result, the key words in the current development paradigm are: ownership, alignment, harmonization, and results- orientation. This has also resulted in increased emphasis on budget support to recipient countries and in creating an overall policy environment conducive to long-term growth. Project approach, sector wide approach and budget support. Which way to go? In spite of the international trend, Iceland’s engagement in policy dialogue with developing countries through its membership in international organizations has been quite limited. Iceland may though have made an effort to be more active on a case by case basis, for example, when an Icelandic official has occupied the Executive Director position at the Nordic-Baltic World Bank Office in Washington DC and when an Icelandic Minister represented the Nordic and the Baltic states on the World Bank’s Development Committee. At the bilateral level, when Iceland engages directly with partner countries, it has always used, and still uses, the so called project based approach when planning and implementing projects. The project based approach means that ICEIDA defines small sector specific projects, with an agreed timetable, in cooperation with the receiving country, but the financial administration of the project is maintained within ICEIDA. This is out of line with the mainstream approach in development cooperation as it is conducted today, emphasizing country ownership and using the planning, budgetary and procurement systems of the receiving/partner country. Furthermore the projects supported by ICEIDA have a narrow focus. Initially only small fisheries projects where thought to be feasible and small ad hoc social sector projects were included. Since 1997, however, Iceland has increasingly become involved in supporting education projects and health projects, but those still use the narrow project approach. More recently Iceland is getting involved in energy projects, which is one area where the private sector is also exploring opportunities in providing technical assistance and investment. The small projects currently in ICEIDA’s portfolio are time consuming to prepare, costly to implement and monitor, and their link with the overall policy of the receiving country, and within the sector supported, is often unclear. In addition to this the project based approach often makes aid coordination time consuming and cumbersome. Recently the government of Iceland had planned a substantial increase in its contributions to international development cooperation with the ambition to reach 0.35 percent of Gross Domestic Product (GDP) by 2009. This was spelled out in Iceland’s Policy on Development Co-operation 2005 to 2009 issued by the Ministry for Foreign Affairs in 2005 (Ministry for Foreign Affairs, 2005). The long-term ambition was to reach the UN target of 0.7 percent of Gross National Income as stated in the Ministers speech at the UN General Assembly in 2006. In the speech the minister said: “Beyond 2009, our assistance should increase even further, with the ambition of reaching the UN target of zero point 7 per cent (0.7%) of GNI (Gross National Income)” (Ministry for Foreign Affairs 2006). However, there was no timetable in the speech on the 0.7 % of GNI goal. In fact, Iceland committed itself to reach this with its first legislation on development cooperation in 1971, but was never able to live up to that commitment (Alþingi 1971). The Minister was thus repeating a 35 years old promise at the UN in 2006. The current financial crisis has already resulted in cuts in Iceland’s development budget and it already seems clear that Iceland did not reach 0.35 of Gross Domestic Product in 2009. However, at the time of this writing the numbers for 2009 were still not confirmed by the Ministry for Foreign Affairs. Given the recent trends in international development cooperation one may ask the question whether or not the time has come for Iceland to engage in policy dialogue with developing countries and support sector wide operations in its development cooperation or perhaps provide a direct budget support in partnership with other donors, including small states, along with technical assistance and advisory services that often accompanies such assistance. In the case of the sector wide approach Iceland would work with other donors and direct its funds to a specific sector. Iceland would then participate in a dialogue with the receiving country, in partnership with the other contributing donors, about the overall development of that sector. In the case of budget support Iceland would along with other donors provide funds directly to the receiving countries budget and engage in an overall policy dialogue with the receiving countries again in partnership with other contributing donors. Among the problems with the project based approach currently used by ICEIDA is, that it is often to a large extent managed and controlled by the donor, in this case Iceland. Therefore many donor countries, including the other Nordic Countries, are increasingly getting involved in budget support and use it as means to engage in policy dialogue with the developing country and to help the government of the receiving country to take the lead and ownership of the overall policy reform in the country. Many donor countries, including the Nordic Countries, also provide technical assistance to help the governments of developing countries prepare and implement policy reforms. If the government of Iceland, like many other donor countries have already done, decides to change its approach and get involved in budget support operations, in addition to the project approach, there needs to be some certainty, or at least a reasonable likelihood, that good economic policy and good governance leads to stronger economic growth, which in turn provides the basis for poverty reduction in the developing world. The war against poverty in the world will not be won in the long-term without economic growth. The so called Washington consensus attempted to summarize the outcome of the debate on what policy stances are conducive to economic development. In its original formulation, the Washington consensus prescribed a policy that could be summarized in ten propositions as follows: (i) fiscal discipline, (ii) a redirection of public expenditure priorities toward fields offering both high economic returns and the potential to improve income distribution, such as primary health care, primary education, and infrastructure, (iii) tax reform (to lower marginal rates and broaden the tax base), (iv) interest rate liberalization, (v) a competitive exchange rate, (vi) trade liberalization, (vii) liberalization of FDI inflows, (viii) privatization, (ix) deregulation (in the sense of abolishing barriers to entry and exit), (x) secure property rights (Williamson 2000, Center for International Development, Harvard University 2003). Although there is empirical evidence to support many of these policies the IFIs were heavily criticised during the 1980s and the early 1990s for interpreting the policy prescription too literally, without country specific circumstances, institutional conditions, or effects on poverty. There continues to be a debate about the relationship between good policy environment and economic growth. David Dollar and Craig Burnside published a famous article almost a decade ago where the case was made that aid had positive impact on economic growth in countries with good economic policies (Burnside and Dollar 2000). They concluded that making aid more systematically conditional on the quality of policies would likely increase its impact on developing countries’ growth. Other authors have been more cautious in concluding that aid promotes growth in countries with sound policies (see for example Easterly, Levine and Roodman 2004) and emphasize that the seminal paper of Burnside and Dollar does not provide the final answer on this critical issue. The debate on the relationship between economic policies and growth is likely to go on for a very long time, and it is safe to say that we do not know with any certainty which policies are most conducive for economic growth and poverty alleviation. However, while no one has found a “magic bullet” for growth there are some things that seem important, including sensible macroeconomic management; laws and policies that create an environment conducive to private sector activity with low transaction costs; and an economy open for international trade (see for example Rajan 2005). Investment in health and education also ought to be encouraged. In fact, the emphasis on macroeconomic stability and outward orientation in the Washington consensus, have been and still remain, important components of sustainable development strategies. Small states and the policy dialogue – What impact can a small state like Iceland have? What role can a small state like Iceland play if engaging in policy dialogue with developing countries and what impact could its participation have? Keohane suggests that we focus on the systemic role states´ leaders see their countries playing and their impact on the international community. Those are the following: System-determining when a state plays a critical role in shaping the international system, System-influencing are states that cannot expect individually to dominate the international system but may be able to influence it, System-affecting states are those that cannot affect the international system alone but can exert significant impact on the system working through small groups or regional international organizations, and finally, System-ineffectual states that can do little to influence the system-wide forces that affect them, except in groups which are so large that each state has minimal influence. (Keohane 1969) What category does Iceland fall under with respect of international financial institutions? The most important groups that Iceland has associated it with internationally are the Nordic countries and more recently also the Baltic States. This cooperation also extends to IFIs. For example, at the World Bank Group, Iceland shares an Executive Director’s Office with the Nordic and the Baltic Countries. Iceland also shares an office with Estonia and Sweden at the European Bank for Reconstruction and Development. Iceland’s cooperation with the other Nordic states and, since the early 1990s, the Baltic States in the World Bank Group has given Iceland a more significant role within the Bank Group. If Iceland engages alone in policy dialogue with developing countries bilaterally, or in partnership with an IFI with a very large number of other countries, it is likely that it will have a limited impact and would probably be classified as system-ineffectual, i.e. it could probably in most cases do little to influence the system-wide forces. However if it works in partnership with a small group of donors like the Nordic and the Baltic group it could become system-affecting. The Nordic countries, especially Denmark, Norway and Sweden are global leaders in international development cooperation and can, as a group, have significant impact on the system worldwide. Iceland’s financial contributions to international development efforts will in most cases be quite small in a global context. This should however not discourage a small country like Iceland to take part, share its experience and provide advisory services sand technical assistance when possible. Iceland’s experience, successes as well as failures, can be of interest to developing countries, especially the smaller states. Its public administration is very small compared to the public administrations of larger nations and specialisation is subject to limitations. Prioritization in such circumstances is key. Iceland’s experience in development since the World War II is unique and could provide valuable lessons, especially for small developing countries, and countries in transition. In spite of its limited capital and human resources, Iceland successfully went through a transition from a colony to full independence in 1944. The current financial crisis has hit its economy hard but remains a high income economy. Its experience could be of value to small less developed nations and demonstrate to them what is possible, and what to avoid. Iceland should not only share its success stories. One can also learn from mistakes that have been made. The recent banking crisis also shows how vulnerable a small state can be if the business community fails and the government does not take action in time to protect the economy from an economic crash. This raises questions on how a small country like Iceland relates to the international community and on the role of the state. One should also not underestimate the value of a well informed and prepared policy dialogue with developing countries and the technical assistance often provided to support such reform efforts. In fact, many development experts would argue that in the end good policy environment is the key to achieve sustainable economic growth and poverty reduction. Foreign aid alone cannot buy growth. Iceland has been surprisingly hesitant to offer its assistance to other countries based on this experience and success in handling many of it’s issues. It has also hesitated to use its experts to provide advice and technical assistance to developing and transition countries, limiting this assistance to the fishery sector and with small projects in health and education sectors. This seems rather narrow given Iceland’s experience. When the Baltic States announced their independence from the Soviet Union, Iceland was the first country to recognize them. Iceland did however not offer assistance during their transition. As a small state, its experience could have been just as relevant as the experience of the other Nordic countries, all of which became active in assisting the Baltic States following their independence. The Baltic States have all been initiating their international development cooperation. Estonia is already a high income country and Latvia and Lithuania are upper middle income countries (World Bank 2008). Priority countries for Estonian development cooperation are: Afghanistan, Georgia, Moldova and Ukraine (Ministry of Foreign Affairs, Estonia 2010). Latvia has chosen Belarus, Georgia, Moldova and Ukraine as its development cooperation priority countries (Ministry of Foreign Affairs, Latvia 2009) and Lithuania selected Afghanistan, Iraq, Belarus, Moldova, Ukraine, Russia, Georgia, and Armenia for its development cooperation and democracy promotion projects (Ministry of Foreign Affairs, Lithuania 2009). While initially those countries may use project approach, sharing their transition experience through policy dialogue with less developed countries, especially countries further to the south and to the east, may be the most valuable assistance they can offer to their partner countries. They should both share their successes as well as lessons from mistakes that have been made. The Baltic States should avoid the fragmented institutional structure that Iceland has chosen, dividing the IFIs between ministries, and delegating the bilateral development cooperation to an independent agency with limited accountability vis-à-vis the central government. The result in Iceland has been that no single institution has a full overview of Iceland’s relations with IFIs. Its development cooperation practices are out of line with international best practice and its private sector is exposed to unnecessary risks when investing in emerging market economies. The private sector plays an important role in the economic reconstruction of emerging markets through business activities and foreign direct investment. However, there are risks involved. Recently Icelandic energy companies like Reykjavík Energy Invest (REI) (http://www.rei.is/) and Geysir Green Energy (http://www.geysirgreenenergy.com/) have been getting involved in energy projects in Asia and Africa. Reykjavík Energy Invest provides information on its website on projects that are at various stages of development in Djibouti and Indonesia (Reykjavík Energy Invest, 2008) and Geysir Green Energy is involved, e.g., in projects in the Philippines and in China (Geysir Green Energy, 2008). The World Bank Group issues a Doing Business report yearly that evaluates the business and investment climate in most countries in the world and the 2009 report for example ranked 181 countries on the ease of doing business. The countries that Icelandic energy companies are planning investments in are ranked in the following way on the overall ease of doing business: Djibouti 153, Indonesia 129 and the Philippines 140. According to this ranking, those are note exactly ideal places for firms seeking a favourable business and investment climate. More specifically on protecting investors Djibouti is ranked number 177. On starting a business Indonesia is ranked number 171 and the Philippines number 155 (World Bank 2008). On a Corruption Perception Index those countries rank in the following way out of 180 countries: Djibouti 102, Indonesia 126 and Philippines 141 (Transparency International 2009). While there certainly are energy resources to be utilized in those countries and investment opportunities that could potentially be profitable and mutually beneficial for Icelandic companies and the host country, there are also pitfalls to avoid, and risks that need to properly be taken into account, and risk mitigation sought when possible and feasible. This is especially important for firms from small states. There are specific risks that investors must consider when investing in projects overseas. When business transactions occur across national borders, they carry risks that are not present in domestic transactions. These additional risks are called country risks. For an analysis of the country risk associated with cross-border investment, see, for example, Meldrum (Meldrum, 2000). According to Meldrum, analysts have tended to separate country risk into six main categories: (i) economic risk, (ii) transfer risk, (iii) exchange rate risk, (iv) location or neighborhood risk, (v) sovereign risk, (vi) political risk. (i) Economic risk refers to a significant change in the economic structure or growth rate in the host country that may result in a major change in the expected return of an investment. (ii) Transfer risk is the risk arising from a decision by a foreign government to restrict capital movements. (iii) Exchange Rate risk is an unexpected adverse movement in the exchange rate of the host country’s currency. (iv) Location or neighborhood risk includes spillover effects caused by problems in the region, in a country’s trading partner, or in countries with similar perceived characteristics. (v) Sovereign risk involves whether a government will be unwilling or unable to meet its loan obligations, or is likely to renege on loan guarantees. Finally (vi) Political risk concerns risk of a change in political institutions stemming from a change in government control, the social fabric, or other non-economic factors (for more detail, see Meldrum 2000). Those risks also need to be considered by private sector investors and IFIs, for example, offer guarantees against political risk. Given the important role of the private sector in the development and economic reconstruction in emerging market economies, international financial institutions increasingly focus on private sector partnerships to boost economic growth and reduce poverty in the developing world. Those are the same institutions that support government projects and engage in economic policy dialogue with emerging market economies, i.e: (i) The World Bank Group, (ii) The European Bank for Reconstruction and Development, (iii) The Asian Development Bank, (iv) The Inter-American Development Bank, and (v) The African Development Bank. While several Icelandic energy companies have technical expertise to engage in emerging markets they can hardly afford taking excessive risks. Balance sheets of many Icelandic companies are weaker now than they were prior to the current economic crisis and all the largest banks in Iceland have collapsed. The crisis is also not limited to Iceland and many international investment banks are also going through difficulties and supply only limited capital for investments in emerging markets. One way that Icelandic companies could ensure appropriate risk mitigation and access funding is to work in partnership with the private sector arms of those international financial institutions. Among the financial products and services that the IFIs offer their private sector partners are: (i) equity financing and/or loans for private sector projects, (ii) guarantee/insurance against political risk (non-commercial risk), (iii) technical assistance and, (iv) information and advisory services. Access to the financial products and services of IFIs and partnership with them could be an option that Icelandic firms increasingly need to consider. IFIs play an important role, not just by lending to projects and through equity investments, but also by mobilizing additional private sector funding. They can also access host country governments at the highest level in the event of a political dispute. There is a variety of guarantee instruments developed by IFIs to reduce political risks further and encourage the private sector to engage in emerging market economies. The World Bank for example consists of five institutions: The International Bank for Reconstruction and Development (IBRD), the International Development Association (IDA), the International Finance Corporation (IFC), (iv) The Multilateral Investment Guarantee Agency, MIGA and (v) The International Centre for Settlement of Investment Disputes, ICSID. Emerging market economy countries would hesitate to take measures that would negatively affect projects that the MIGA is involved in because of the concern that it could adversely affect their relationship with the IDA and/or the IBRD and possible credit or a loan (West 1999). If disputes do arise, the MIGA’s leverage with host governments frequently enables it to resolve differences to the mutual satisfaction of all parties. The services that IFIs offer in managing risks in emerging markets might be more relevant for Icelandic investors now than they were prior to the international financial crisis and the banking crisis in Iceland. This is especially the case with investments in the energy sector where projects are often large and tend to have long repayment periods. If an Icelandic company invests in the energy sector in an emerging market economy, it must consider a long-term horizon to receive sufficient return on its investment. The investment contains a higher degree of risk, simply because the company remains exposed to risk for a long period of time. In addition to this, geothermal energy is often located in developing countries which tend to be more risky for investors than developed countries. The profitability of such investments can be influenced by the decisions of the host governments during the lifetime of the projects. This is one important reason for Icelandic companies to work in partnership with IFIs as part of their risk-management strategy. A small state like Iceland needs strong partners when engaging in long-term capital intensive investments in risky markets. In some cases, the Icelandic government has weak diplomatic ties with emerging markets economies in which Icelandic companies are planning to invest, and in many cases it does not have embassies in those countries. In the event of a dispute, a small country like Iceland does not have the same leverage as large states and partnership with IFIs could therefore be of advantage. Partnership with IFIs could reduce risks both for the private sector and the government of Iceland. After the collapse of the largest commercial banks in Iceland there is also a need to rebuild trust, domestically as well as internationally, and cooperation with reputable IFIs could help in that process. The government has devoted limited funding and few human resources towards its relationship with IFIs and Iceland is not a member of key IFIs. Through partnership with IFIs Icelandic firms could potentially learn valuable lessons on project preparation and management in emerging markets and improve their risk management. The government of Iceland could consider devoting more funds to provide technical assistance and know-how transfer to emerging markets. This could be done through trust funds administered by IFIs, as well as bilateral funds. Greater use could thus be made of Icelandic experts to cooperate with the IFIs as consultants and for Icelandic firms to prepare cross border investments. The services of IFIs are not a free lunch and therefore costs of their financial products and services (loans, advisory services, guarantees, etc) must be weighed against the potential benefits. So far Iceland has been inactive in its cooperation with international financial institutions and has favored bilateralism over multilateralism. Iceland’s international cooperation has to a large extent been driven by concreting on its own benefits and self interest. This contradicts the small-state literature that often assumes that small states attach high importance to working within multilateral organizations. The special relationship with the United States may have contributed to Iceland’s favour for bilateralism. Iceland needs to consider providing assistance to developing countries and emerging market economies beyond small projects that use the project based approach only. Iceland could engage in policy dialogue with developing countries in selected policy areas agreed to with the receiving countries. This is probably best done in partnership with international financial institutions and other bilateral donors. This would provide Iceland with an opportunity to try new approaches and better share its own experience in development and reconstruction with partner countries. When Iceland acts alone it must be classified as system-ineffectual, i.e. a state which adjusts to the international system but cannot change it. However Iceland could become system affecting and exert significant impact on the international system when working with a small group of countries like the Nordic and the Baltic states as it does at the World Bank Group. However, Iceland has only been active when it has held the position of Executive Director or chaired committees like the Development Committee. The government needs to make sure that Icelandic companies investing in emerging market economies have the same access to international financial institutions as do companies from other developed countries. Through partnership with IFIs Icelandic firms could potentially learn valuable lessons on project preparation and management in emerging markets. Iceland´s contribution to international development cooperation is made less effective than it could possibly be by the government’s negligence in properly conducting its relationship with those IFIs that Iceland is member of, and not seeking membership in other IFIs, including the regional development banks. This can also expose its private sector to unnecessary and excessive risks when investing in emerging market economies. Iceland can ill afford such government negligence in the aftermath of a banking crisis. Careful investments and appropriate risk management measures are key lessons that the Icelandic private sector should learn from its current banking crisis. The Icelandic government should also by now have learned, unfortunately the hard way, that excessive debts and risks taken by the private sector abroad can have serious consequences for the Icelandic national economy and jeopardize its stability. One consequence of the fragmented institutional structure used in Iceland’s international development cooperation is that no single ministry or institution has a full overview of Iceland´s relations with IFIs and Iceland´s development cooperation practices are increasingly out of line with international best practices. A small state like Iceland needs strong partners when engaging in large long- term investments in risky markets. In some cases, the Icelandic government has weak diplomatic ties with emerging markets economies and in many cases it does not have embassies in those countries. In the event of a dispute, a small country like Iceland does not have the same leverage as large states and partnership with IFIs could therefore be of advantage. The government has devoted limited funding and few human resources towards its relationship with IFIs and Iceland is not a member of certain key institutions. More funds are needed to build a stronger relationship with IFIs. at: http://www.althingi.is/altext/stjt/2008.121.html (Accessed on December 20, 2009). Alþingi (1981). Lög um Þróunarsamvinnustofnun Íslands nr. 43/1981. Alþingi (1971). Lög um aðstoð Íslands við þróunarlöndin nr. 20/1971. Economic Review, Vol. 90, No. 4, pp. 847-68. Consensus, available at: http://www.cid.harvard.edu/cidtrade/issues/washington.html (Accessed on January 8, 2010). Czinkota, Michael R., Ilkka A. Ronkainen and Michael H. Moffett. (2005). International Business 7th edition. USA: Thomson South-Western. 782 p.
Business – Environment and Operations 11th Edition. NJ: Pearson Prentice Hall. 792 p.
Comment. American Economic Review, Vol. 94, No. 3, pp. 774-80.
http://www.geysirgreenenergy.com/(Accessed on June 8, 2009). Hoadley, J. Stephen, (1980). Small states as aid donors, International International Organizations 31,1, Winter 1980, pp. 121-137.
http://www.iceida.is/frettir/nr/961 (Accessed on March 30, 2009). Development Cooperation, available at: http://www.iceida.is/english/iceida/Committee/ (Accessed on March 28, 2009). http://archive.constantcontact.com/fs049/1102056362425/archive/1102522535529.html (Accessed on April 7, 2009). http://archive.constantcontact.com/fs049/1102056362425/archive/1102510499049.html (Accessed on March 31, 2009). http://archive.constantcontact.com/fs049/1102056362425/archive/1102522535529.html(Accessed on March 31, 2009). (Accessed on March 30, 2009). http://www.ifc.org/ifcext/media.nsf/content/SelectedPressRelease?OpenDocument&UNID=16385EB890EFF860852574790051DABB (Accessed on January 2, 2010). http://www.ifc.org/ifcext/gms.nsf/AttachmentsByTitle/Electrical_Equip_Brochure/$FILE/Electrical+Equip+Broch.pdf (Accessed on January 20, 2010). (Accessed on December 28, 2009). Organizations, Vol. 46, No. 3 (Summer, 1992), pp. 681-708. Politics. International Organizations, Vol. 23, No. 2 (Spring, 1969), pp. 291-310. Economics, 35 (1), 33-40, available at: http://proquest.umi.com/pqdweb?index=12&did=49837719&SrchMode=1&sid=2&Fmt=6&VInst=PROD&VType=PQD&RQT=309&VName=PQD&TS=1177081310&clientId=58032 (Accessed on February 9, 2010). (Accessed on January 20, 2010). http://www.mfa.is/ministry/organization/ (Accessed on February 11, 2010). utanríkisráðuneytisins available at: http://www.utanrikisraduneyti.is/frettaefni/frettatilkynningar/nr/4628 (Accessed on March 29, 2009). Ministry for Foreign Affairs, Iceland. (2006). Ávarp utanríkisráðherra Íslands á 61. (Accessed on January 2, 2010). (Accessed on November 25, 2009). countries, available at: http://www.mfa.gov.lv/en/DevelopmentCo-operation/info/ (Accessed on March 20, 2009). (Accessed on March 28, 2009). Development, December 2005; 42, 4. 53-55. Rugman, Alan M. and Simon Collinson (2006). International Business 4th edition. Harlow England: Prentice Hall – Financial Times. 664 p.
international arena? Iceland’s approach to foreign relations until the mid-1990s. Stjórnmál og stjornsýsla – Veftímarit, Stofnun stjornmála og stjórnsýslu, Háskóli Íslands. 1:1, 107-140, available at: http://stjornmalogstjornsysla.is/images/stories/fg2005/baldur.pdf (Accessed on January 1, 2010). (Accessed on December 1, 2009). West, Gerald T. (1999). Political Risk Investment Insurance: A Renaissance. http://search.ebscohost.com/login.aspx?direct=true&db=buh&AN=2294975&site=ehost-live (Accessed on January 28, 2010). edition. New Jersey: Pearson Prentice Hall. 506 p.
(Accessed on November 8, 2009). http://www.doingbusiness.org/Documents/FullReport/2009/DB_2009_English.pdf (Accessed on November 28, 2009). (iv) The Inter-American Development Bank, IDB (http://www.iadb.org/) and (v) The African Development Bank, AfDB (http://www.afdb.org). The World Bank Group consists of five institutions: (i) The International Bank for Reconstruction and Development, IBRD, established in 1944 to rebuild Europe after the destruction of the Second World War, (ii) The International Development Association, IDA, established in 1960, (iii) The International Finance Corporation, IFC, established in 1956, (iv) The Multilateral Investment Guarantee Agency, MIGA, established in 1988, and (v) The International Centre for Settlement of Investment Disputes, ICSID, established in 1966. The IBRD and IDA support the governments of emerging markets and developing countries and require government guarantees on their loans, while IFC and MIGA support the private sector in those countries without accepting government guarantees. The European Bank for Reconstruction and Development was established in 1991 when communism was crumbling in central and eastern Europe and ex-soviet countries needed help during the transition to a market economy. This transition was to a large extent driven by a new private sector. The Ministry for Foreign Affairs has delegated its responsibility to conduct the relationship with the private sector arms of the World Bank Group, i.e. IFC and MIGA, to the Trade Council of Iceland. This weakens the MFA’s ability to coordinate its relationship with IFIs. The new law “Lög um alþjóðlega þróunarsamvinnu Íslands” was passed by the parliament on September 11, 2008. This Directorate is according the Ministry for Foreign Affairs responsible for Iceland Crisis Response Unit, the Department of International Development and the relations with ICEIDA (Ministry for Foreign Affairs 2009). ICEIDA has referred to this committee as the Consultative Committee on International Development Cooperation whereas the Ministry for Foreign Affairs has referred to this same body as the International Development Policy Council. The new law on International Development Cooperation refers to this council as Council on International Development Cooperation. The Steering Group constitutes the Director General of the Directorate for International Development Cooperation, the Director of the Department for International Development, the Head of the Iceland Crisis Response Unit, the Director General of ICEIDA and the Permanent Secretary of State who also chairs the steering group. ICEIDA operated in six countries until recently: Malawi, Mozambique, Namibia, Nicaragua, Sri Lanka, and Uganda. ICEIDA thus operated in three continents that can hardly be cost efficient for such a small agency. In 2009 the agency decided to close its offices in Sri Lanka and Nicaragua (ICEIDA 2009c). Those offices have now been closed and the office in Namibia will be closed at the end of 2010. The Ministry of Commerce, for example, handles the relationship with the European Bank for Reconstruction and Development (EBRD). EBRD is engaged in the emerging markets in Europe and now also in Central Asia. http://www.adb.org/), (ii) The Inter-American Development Bank, (IDB) (http://www.iadb.org/) and (iii) The African Development Bank, (AfDB) (http://www.afdb.org). A notable exception to his is the recent request for Stand-by Arrangement with the International Monetary Fund (IMF 2008). In addition to Iceland the Nordic countries are Denmark, Finland, Norway and Sweden. ICEIDA – Country selection remains unclear and may have been influenced by a wish to get a seat at the UN Security Council. ICEIDA has now closed it’s offices in Nicaragua and Sri Lanka. The office in Namibia will be closed by the end of 2010. The Millennium Development Goals were established at the United Nations Millennium Summit in September 2000. These roundtables were organized by the World Bank and took place in Washington DC 2002, in Marrakesh in 2004, and in Hanoi 2007. When issuing goals for Iceland´s contributions to development cooperation the Ministry for Foreign Affairs sometimes refers to this contribution as share of Gross Domestic Product and at other times as a share of Gross National Income, etc. There is no consistency on how these different terms are used by the ministry. When discussing project based approach, sector wide approach or budget support, one should avoid pitching the issue in either/or terms. It is not being argued here, for example, that possible Icelandic involvement in budget support to a given developing country would mean that Iceland would abandon project based approach entirely. Some small projects supported by ICEIDA in the past have been successful and it is well known internationally that investment projects can complement budget support operations. Another issue regards the decision whether Iceland should go for sector wide approach rather than budget support. In the case of sector wide approach the funds provided by Iceland would be directed to a specific sector instead of being contributed to the general budget of the developing country in question. In this context one needs to keep in mind that the ultimate decision on what to do with the funds rests with the receiving government. So, if there is more aid funding for sector X, the government can redirect its own resources to other sectors. Thus increasing resources to one sector only can be an illusion and from this perspective, it could be better to provide funds directly to the developing countries general budget. This would for example include: Fiscal discipline, moderate inflation, and a reasonable competitive exchange rate. Recently the IFC and Reykjavík Energy Invest signed an agreement for joint exploration and development of geothermal resources in Djibouti in Africa that will help address the country’s power shortage and reduce carbon emissions (International Finance Corporation 2008). However, Reykjavík Energy Invest in not a typical private sector company. REI is the international business development and investment arm of Reykjavík Energy. In addition those services IFIs often engage in a policy dialogue with the governments of emerging market economies to improve economic policy and management. This includes reforms to improve the business and investment climate for the private sector, to promote business activities, and to encourage foreign direct investment. IFIs also provide loans and credits to various government-led projects in developing countries and emerging markets that are subject to international competitive bidding. This allows private sector firms to participate in the bidding process and potentially to benefit from those public sector projects supported by the IFIs.